Throughout November, we got together with our friends at AGA Magazine to run an amazing competition for their readers and of course you fabulous lot! 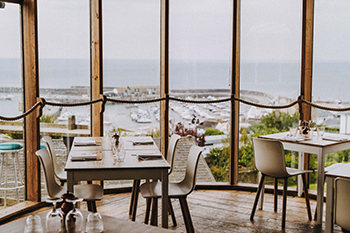 The grand prize was a overnight B&B stay at HIX Townhouse in Dorset’s lovely Lyme Regis plus a £100 voucher to spend in Mark Hix’s delicious HIX Oyster & Fish House, with panoramic views of the iconic Jurassic Coast. There’s no surprise it was such a hit! With over 2000 entrants vying for the prize, we were delighted to announced Emma Norris as the winner. Overjoyed, it just happens to be Emma and her husband’s 27th wedding anniversary and her husbands 50th birthday too. With breathtaking scenery, Lyme Regis is a delight all year round, and we wish them both a very enjoyable, celebratory stay in the new year. We often run competitions giving you the chance to win scrumptious prizes all year round. Just keep your eyes peeled on our website and and social media pages (Facebook, Instagram and Twitter).